You’ve anticipated a trip for a long time—saving money, reading the hype about a spot, and imaging yourself having the perfect getaway—only to be disappointed by the actual experience of being there. Sometimes this happens because two of your flights got delayed, your luggage got lost, the weather was bad, and the street tacos you tried gave you food poisoning. Other times we feel disappointed even when—at least on the surface—everything went as planned. We’re left unsatisfied even though we saw and did everything we had intended. Simply put, we’ve become victims to our vacation expectations. Vacation expectations are near-certain beliefs that something is going to happen or be achieved in the future by someone. The expectation that every moment of your beach vacation will look this perfect can cause a lot of problems. 1.) Your expectations are met. This usually brings a neutral feeling, which isn’t quite contentment. Generally a slight twinge of disappointment as we always hope for our dreams to be exceeded. 2.) You expectations are not met. We become angry, disappointed, sad, or resentful. 3.) Your expectations are exceeded. Genuine surprise. An enjoyable feeling. How common is this if you already have expectations? Because two of the three outcomes available to us when we have expectations are generally negative, in Eastern traditions this is referred to as the “wanting mind” and is considered the root of all unhappiness and suffering in life. One of the big problems with travel expectations is that they’re often based on fantasy rather than reality. Unless we’re visiting a place we literally know nothing about, we all—to some degree—construct a mental picture of what we think our journeys will be like. The more specific your expectations are, the more detailed the picture. Unfortunately, the content we base this mental pre-trip image from—what we’ve read in guide books, seen in magazines, and heard from friends—is not reality. Rather, it’s a carefully-curated idealization. After all, it’s the travel industry’s job to make places look as enticing as possible. 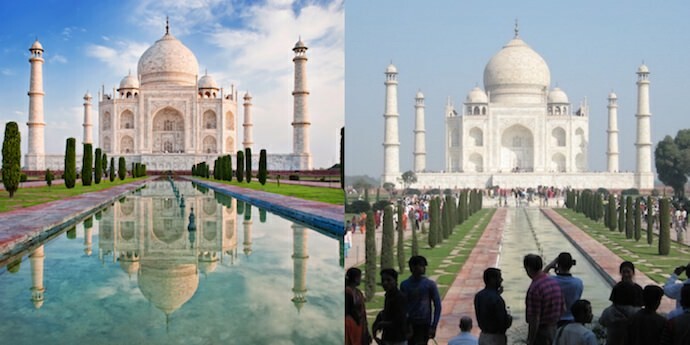 Expectations versus reality at the Taj Mahal, India. Even friends and family are guilty of this when they almost instinctually upload the best-looking (and perhaps color-corrected) photos of their travels to social media. So it should come as no surprise when our actual experiences don’t match the heavily-filtered, Instagram-influenced pictures we have in our minds. Another problem with travel expectations is that they make future assumptions about things largely outside our control. We have an innate desire to control things. And in much of our lives, we’re able to do this thanks to technology. We can determine what we watch on TV, when we watch it, what we eat, when we get that food, etc. When we travel, we lose a lot of that control. We enter into a world where the rules are set by others or are completely out of human control. Much as we might wish it were the case, we have little to any say over how a landscape looks, what the food tastes like, or how the locals respond when you say hello. 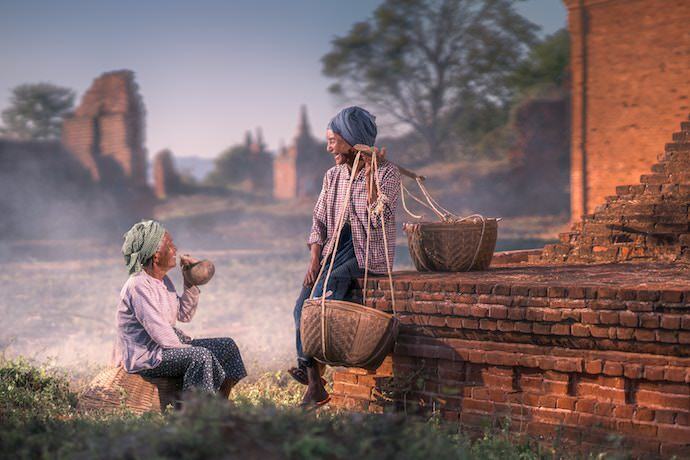 Most of the people you meet traveling are incredibly friendly—like these two in Old Bagan, Myanmar—but know that ultimately how people respond is out of your control. Likewise, vacation expectations take us out of the present movement. When we hold strong expectations—which are based in hypothetical futures—our minds tend to think about anything other than what is right in front of us. So instead of enjoying the feeling of the mediterranean sun hitting our skin in Greece or the tase of our sushi in Japan, we’re thinking about the hot air balloon ride we’ll be taking tomorrow or the next hotel we’re staying in. And as a result we have less intense and less pleasurable experiences. Expectations also make your travels more bland. One of the most exciting aspects of travel—and the true definition of adventure travel—is having uncertainty as to what exactly the future days will hold. When you arrive at your destination with a near-certain belief about what your trip is going to be like, you’re consciously eliminating the opportunity for spontaneity and adventure. 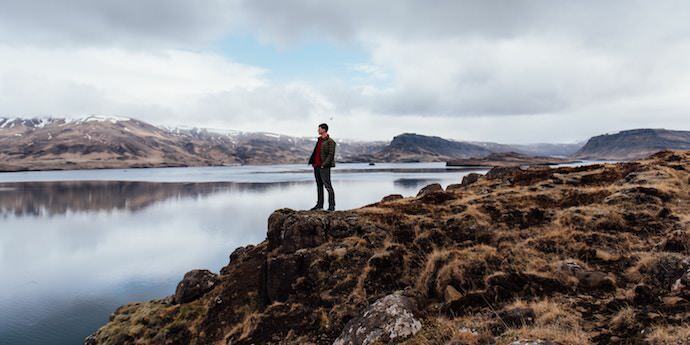 The best travel experiences so often come in unplanned moments. The more you’ve planned and curated your trip in advance to meet certain expectations, the less of an opportunity you have for this serendipity. Obviously you need to plan certain things—it’s not wise to wait until you’re tired every night to look for a place to sleep—but view your itinerary as flexible. This also doesn’t mean abandoning your budget—you can stick to budget-friendly rules while still going with the flow, as long as you don’t let the flow take you to a $500 meal! I assume that I won’t see or do everything I’ve planned, and I prioritize the top things that I really, really want to do and be sure to do them (often first). It’s important to note that expectations are not the same as standards, and that the elimination of the former does not mean the elimination of the latter. Having a standard for what your 4-star hotel room in New York should contain—and acting accordingly if you find that the staff has forgotten to put a bed in your room—is helpful. It protects you from getting ripped off and helps steer you towards people, places, and activities that bring you value. Setting a clear expectation of what your stay will be like often only leads to disappointment. 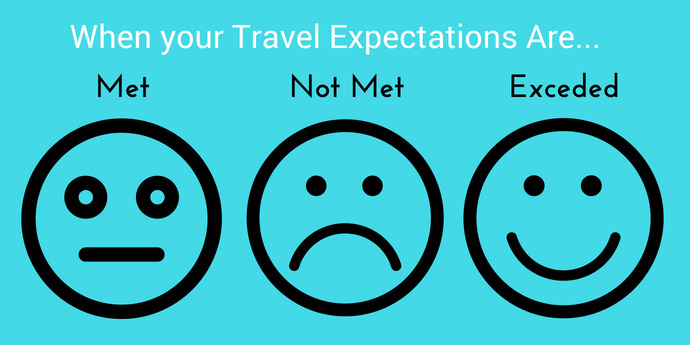 So how exactly do you manage travel expectations? Some people argue that the solution to the disappointment caused from not having your travel expectations met is to lower them. But low expectations can cause just as much anguish as high ones. 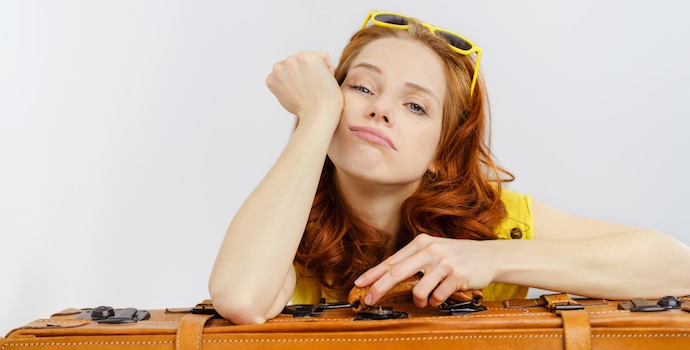 Having low vacation expectations is often a self-fulfilling prophecy. From the start, you’ll interpret everything through a negative lens since you’ve come in assuming things will be bad. A friendly smile might be interpreted as a creepy grin, and and honest misunderstanding could be conflated with a malevolent scheme. And when you tell yourself that there’s little to look forward to on your trip, you lose out on the opportunity to relish in pre-trip anticipation (since who is going to get excited for vacation that’s expected to be sub-par?) one of the most enjoyable aspects of the travel process. Depending on your expectations, your perception of the locals you meet will be very different. Sri Lanka. Others believe that the best way to combat travel expectations is to deny them completely. Since they feel they cannot achieve certain lofty travel goals they tell themselves that they just won’t want any at all. Yet, all this does is create anger and resentment inside yourself. Instead, you actually want to eliminate both the tendency-to-create and the desire-for vacation expectations. You need to understand on a logical and mental level why they are harmful to your travel experiences. Here are 9 ways you can do exactly that. Before you book a trip, ask yourself why you want to take it. What specifically about a place interests you? Are you going just because it’s the hot destination, because a travel guru recommended it, or because you excited to explore the local history and culture? 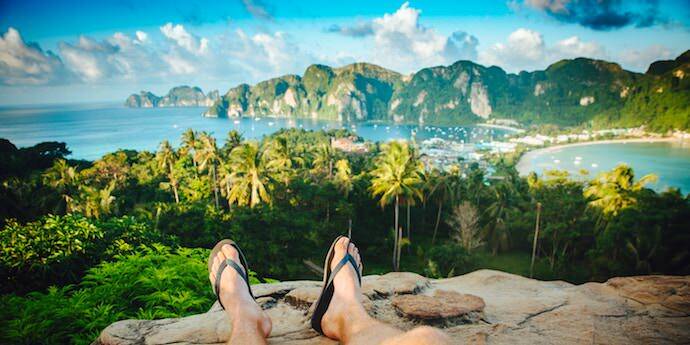 Theres’ nothing wrong with going somewhere that’s popular or following the advice of a trusted travel expert, but be wary of any expectation that come about from this. Are you anticipating that your experiences will look and feel the same what they did in magazines, on Instagram, or in a guide book? How will you respond if your experiences are different? Would you still be interested in going there? 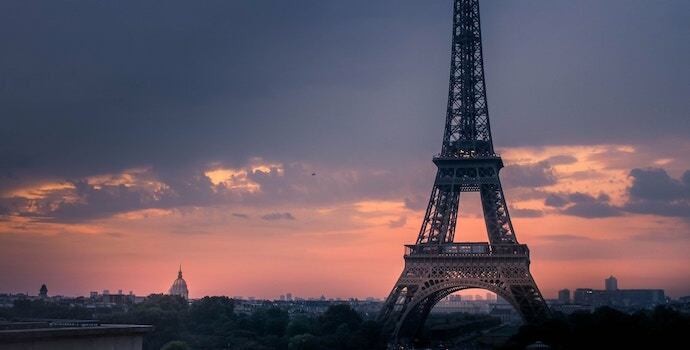 While Paris can be incredibly charming, it's also often a disappointment for visitors who visit because they feel they ought to. 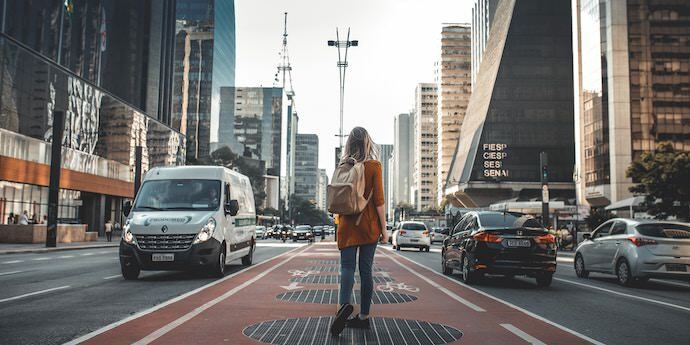 Spending some time thinking about the reasons why you’re traveling to a given destination before you book a trip can greatly diminish the negative effect that expectations have when you’re actually on the road. Before you leave home, ask yourself if there’s anything you feel like you should do on your trip. Shoulds are expectations based on other people’s values rather than your own. If they were based on your own values, you’d wouldn’t need social pressure to convince you to do them. For example, if you’re traveling to Venice, you might feel like you should take a gondola ride, even if you yourself aren’t that interested in the idea. Eliminating shoulds often quickly gets rid of a good number of clearly unnecessary expectations. Knowing your values and purpose for travel—and setting goals based upon this knowledge—can be immensely helpful. It gives you focus, inspires action, and provides strength in challenging moments—like when the unexpected happens—both before and during trips. Unfortunately, sometimes we turn our goals into expectations. We begin to see our goals not as something we want to achieve but rather as something we expect to achieve. High-performs and optimists are often guilty of this. Also, setting travel goals that are process-based rather than outcome-based can help alleviate some of this stress. 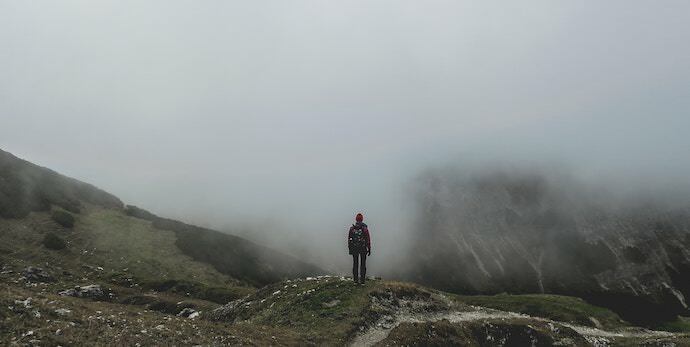 Setting a goal of 'I hope to climb to the top of the mountain' is better than the goal of 'I expect to have an incredible view from the mountains' because can't control whether or not your view from the mountain top is obscured by fog. Think about it. If you have expectations to marry and live happy ever after after seeing one person for a date you will be most likely be disappointed. However, if you have a goal to just meet interesting people and hopefully eventually find someone special, you’ll be able to more easily handle the ups and downs of dating. One thing you always have power over is your response. You cannot control the reality of your trip, but you can control how you react. You can be happy and take things with stride or you can be angry. Approach your travels with an attitude of adventure, flexibility and openness rather than rigid expectations and you’ll be better suited to respond when things go wrong. 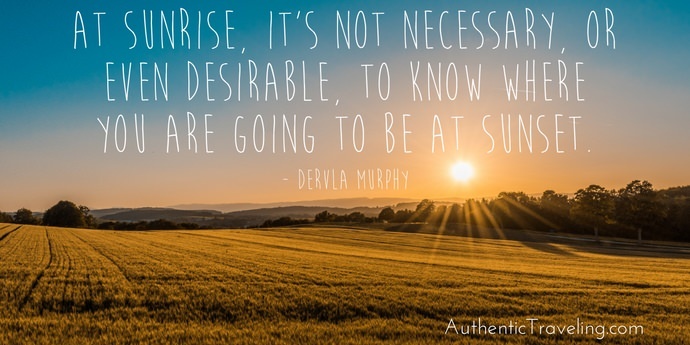 The unexpected (and therefore, the absence of expectations) is where adventure lies. Another great way to combat expectations is to create specific periods of time within your schedule where you have no expectations. You can block off a few hours, a whole day, or even a whole segment of a trip as being expectation-free. Wandering around a city like São Paulo, Brazil without any specific goals nor expectations can be immensely rewarding. As many experienced travelers know, these expectation-free periods are often the most rewarding as we feel free to say yes to all opportunities that present themselves and we literally have no idea what will happen next. One of my favorite activities to do during expectation-free time is to wander—to simply explore without any clear plans. It’s OK to have high standards for yourself. Without goals and standards you cannot grow or improve. At the same time, know that you won’t always meet your standards or fulfill your goals. Even if you give your best effort you will inevitable make mistakes. After all, you are only human. Failure is part of the travel process. The best-laid plans often fall apart when they face reality. If you embrace failure, figuring out ways to handle setbacks can actually be part of the fun of travel. In contrast to our heavily-regimented lives at home, on the road we’re surrounded by the unknown and uncertain. 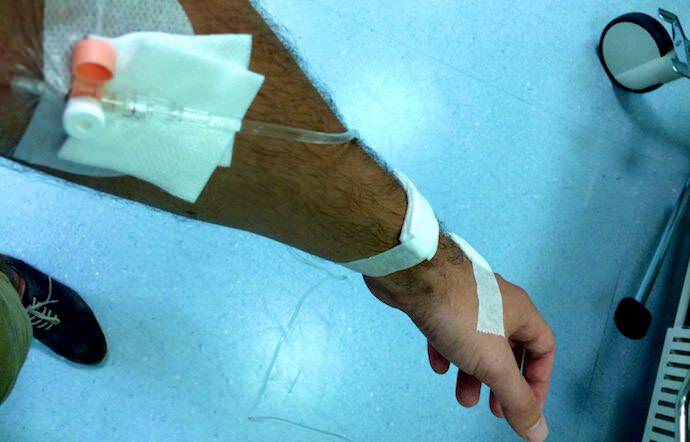 I didn't expect to end up in the hospital with dehydration when I visited Slovenia, but learning to navigate the healthcare system was quite the adventure! Getting an opportunity to use our wits and problem-solving skills to make the best of unexpected situations should be celebrated, not feared. It’s difficult to have very many expectations when you don’t know much about a place. Consider traveling somewhere that you’ve never heard of before rather than a vacation spot that you’ve been seeing photos of for years. TravelSpin.in randomly generates a destination for you, as does GoogleFlights. If I want to avoid expectations I will sometimes book a flight to a place I know little about, doing the minimal amount of research before getting on the plane (usually this means finding a place to stay the first night, although in some places this is not necessary). Then, as I fly there, I’ll do some basic research on what to see and do. This way I can set a few goals without knowing too many details nor having too much time for expectations to form in my mind. Alternatively, you can have someone else plan your entire trip for you, providing you with only the bare details when necessary. Remember that what you read isn’t necessary indicative of reality. Not only is travel-related media notoriously optimistic, but it can also be incredibly inaccurate. Hotels, restaurants, and even entire cities can dramatically change when they become popular. Ask anyone who visited Prague in the 1990s how their experience compares to visiting the city today. Also, everyone views the world through their own lens. How we see the world is shaped by our past experiences and personal preferences. How you view life—and your travels—is greatly influenced by your past experiences, meaning that every traveler's journey is entirely unique and unreproducible. One person’s life-changing encounter or must-see place could be someone else’s overrated tourist trap. To minimize this effect, when you’re looking for travel advice, find someone with whom you share a similar worldview and common interests. Vacation expectations are an insidious thing. Having strong expectations about a trip can cause you to feel disappointed when returning home even when everything goes well. 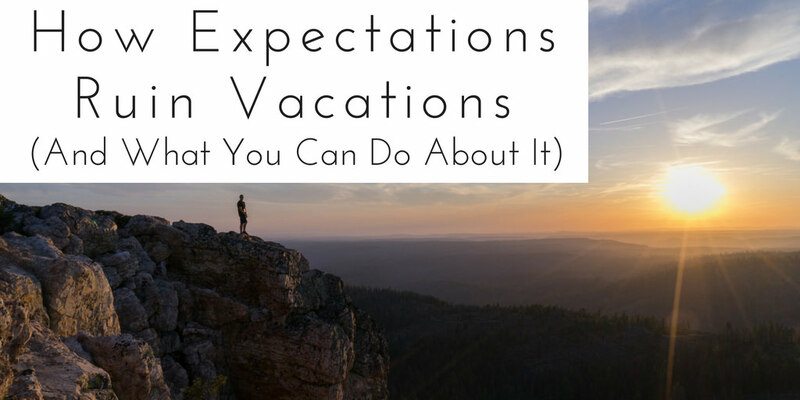 Fortunately, as you’ve seen there’s a number of ways in which you can manage vacation expectations. By following the above steps, you eliminate both the tendency-to-create and the desire-for travel expectations. And in turn, you’ll be more able to appreciate each travel moment for what it is—the only thing that matters at that very instant. Prep your mind for travel today by getting your FREE pre-trip boot camp The Traveler’s Mindset: How to Mentally Prepare for Journeys of Adventure and Growth!